What are the signs and symptoms of Wolff-Parkinson-White syndrome? What are the potential complications of Wolff-Parkinson-White syndrome? What is the treatment for Wolff-Parkinson-White syndrome? What is the prognosis for Wolff-Parkinson-White syndrome? Can Wolff-Parkinson-White syndrome be prevented? Wolff-Parkinson-White syndrome is a specific type of abnormality of the electrical system of the heart. This syndrome causes a specific pattern on an electrocardiogram (Wolff-Parkinson-White pattern) and is linked to an episode of rapid heart rates, such as supraventricular tachycardia (SVT) or atrial fibrillation. Wolff-Parkinson-White syndrome is a treatable medical condition. Wolff-Parkinson-White syndrome is also referred to as WPW syndrome and pre-excitation syndrome. Wolf-Parkinson-White syndrome can affect all ages but is usually diagnosed in children, adolescents, and young adults. Except in rare circumstances, Wolff-Parkinson-White syndrome is not a hereditary condition. 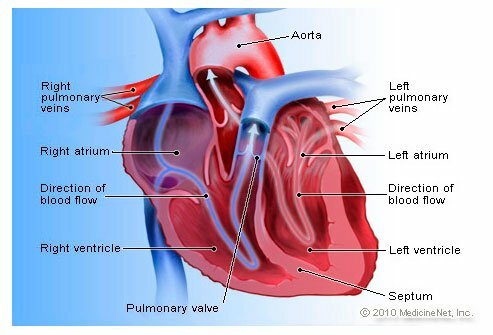 The heart has internal electrical “wiring” that is essential for proper pumping of blood to the rest of the body. In some people, an abnormal extra “wire” is present. This additional connection can cause a short-circuiting that causes the heart to beat very rapidly. This causes abnormal electrocardiogram (ECG) testing with rapid rate rhythms called supraventricular tachycardia or SVT. Of note, the presence of a cardiac arrhythmia such as SVT can be from other heart conditions that are not Wolff-Parkinson-White syndrome. Individuals affected by Wolff-Parkinson-White syndrome can experience palpitations, rapid heart rates, difficulty breathing, and lightheadedness as well as near loss of consciousness and complete loss of consciousness. For the most part, these symptoms occur all of a sudden and are not associated with warning signs. Usually, there are no dramatic triggers, however, caffeine, alcohol, and exercise can cause the heart to start racing. Atrial fibrillation (also referred to as AFib) is the most common type of abnormal heart rhythm. AFib is caused by abnormal electrical discharges (signals) that generate chaotically throughout the upper chambers of the heart (atria). AFib reduces the ability of the atria to pump blood into the ventricles, and usually causes the heart to beat too rapidly. One-half million new cases of atrial fibrillation are diagnosed every year in the U.S., and billions of dollars are spent annually on its diagnosis and treatment. Wolff-Parkinson-White can lead to significant symptoms from the rapid heart rates and can be alarming when first experienced. In addition, episodes can be disruptive and can last from minutes to hours and in some rare circumstances even days to weeks. The most serious complication of Wolff-Parkinson-White syndrome is sudden death, which is rare and has been estimated to be around 0.25% per year. This very rare occurrence can happen if the short-circuit of Wolff-Parkinson-White syndrome triggers another arrhythmia called atrial fibrillation that even more rarely can induce ventricular fibrillation. Ventricular fibrillation can cause sudden death if not treated promptly. Wolff-Parkinson-White syndrome is diagnosed when the specific WPW pattern found on an ECG is linked to an episode of rapid heart rates, such as SVT or atrial fibrillation. The WPW pattern is a combination of what is termed a short PR interval and a delta wave. The rapid heart episode is usually from supraventricular tachycardia or SVT. Of note, the presence of an SVT can be from other more common forms of “short-circuiting” not necessarily related to Wolff-Parkinson-White syndrome, such as atrial flutter or AV nodal reentrant tachycardia (AVNRT). A range of treatment options is available for the management of Wolff-Parkinson-White syndrome. In the majority of people without any symptoms, there is no need for immediate treatment. However, when or if symptoms suspicious for an episode of rapid heart rate occur, a cardiac electrophysiology study is recommended. A cardiac electrophysiology study is a minimally invasive surgical operation in which special wires inserted through the veins in the legs are used to measure electrical activity inside the heart. During this procedure, the connection can be identified, and importantly, can be eradicated, or ablated (a procedure known as ablation). A successful ablation of an extra connection can permanently treat all the symptoms of Wolff-Parkinson-White syndrome, including the risk of sudden death. Finally, in some circumstances, eradication of the extra connection is not possible to perform safely or not desired by the patient. Medications can then be prescribed to help reduce the frequency of rapid heart rate episodes. Of note, the extra connection in the heart can be located on the left side of the heart (type B) or on the right side of the heart (type A). The prognosis for Wolff-Parkinson-White syndrome is excellent. Discussion with your physician can help navigate the treatment options that are available. In general, many people with the electrocardiogram findings of Wolff-Parkinson-White syndrome may never need any type of treatment. Wolff-Parkinson-White syndrome cannot be prevented, but can be treated in the vast majority of people. It is important to seek out a cardiologist or electrophysiologist if you have remaining questions or are in need of treatment. Obeyesekere, Manoj, et al. “Risk of sudden death in Wolff-Parkinson-White syndrome: how high is the risk?” Circulation 125.5 (2012): 659-660. What are the symptoms of your Wolff-Parkinson-White Syndrome? Please share the events that led to a diagnosis of Wolff-Parkinson-White syndrome. What treatment did you have for Wolff-Parkinson-White syndrome? Was it successful? Did you ever have an ECG while you were suffering acute symptoms of Wolff-Parkinson-White syndrome? Heart rhythm disorders vary from minor palpitations, premature atrial contractions (PACs), premature ventricular contractions (PVCs), sinus tachycardia, and sinus brachycardia, to abnormal heart rhythms such as tachycardia, ventricular fibrillation, ventricular flutter, atrial fibrillation, atrial flutter, paroxysmal supraventricular tachycardia (PSVT), Wolf-Parkinson-White syndrome, brachycardia, or heart blocks. Treatment is dependent upon the type of heart rhythm disorder. Propafenone (Rythmol, Rythmol SR) is an anti-arrhythmic agent prescribed for the treatment of life-threatening arrhythmias. Side effects include fatigue, unusual taste, dizziness, blurred vision, and anorexia. Drug interactions, dosage, and pregnancy and breastfeeding safety should be reviewed prior to taking this medication.